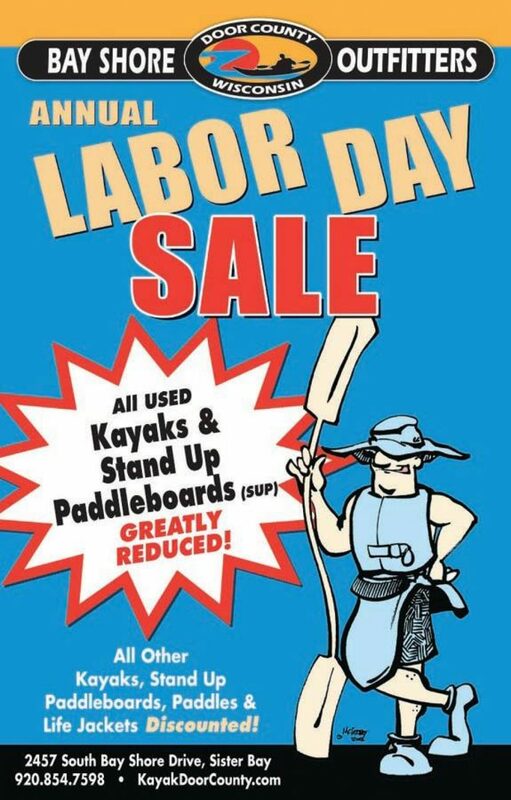 It’s time for our Annual Kayak and Stand Up Paddleboard Sale!!!! Stand Up Paddleboards (SUPs) at closeout prices!!!! Great deals on kayaks from Perception, Current Designs, Wilderness Systems and Necky. Paddleboards from BIC. We also have deals on used paddles, PFDs, spray skirts, dry bags, and other paddling gear! @ 920-818-0431 to put a deposit down. 3. Let us know if you want to pick it up in Sister Bay or Sturgeon Bay on September 2nd. 4. September 2nd come to our Sister Bay or Sturgeon Bay store and pick up your new kayak or SUP! We will be selling used kayak and SUP paddles and used Life jackets. Make sure to mention that you would like to purchase those also. We also have new paddles and life jackets available in both our stores. Don’t forget your accessories for kayaks and SUPS, we carry those too.